Dedicated to promoting the learning of the Italian Language in Charleston, SC and beyond! 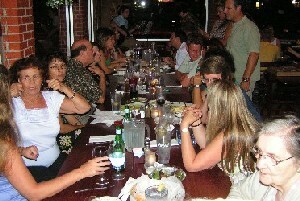 Il tavolo italiano (The Italian Table) was founded in 2008 by Vince Biondolillo and Chuck Wagner in Downtown Charleston, SC. The main intent was to meet once a week in order to have an opportunity to use the Italian they knew. As it happened, only one knew much Italian while the other knew next to nothing. Can you guess if it was Mr Biondolilo or Mr Wagner who knew almost no Italian? Yes, you guessed it. Thier friendship was launched with among other things a statement from Vince to Chuck stating "I am not going to be your tutor". Well as it happened he taught Chuck a lot about the Italian Language, how to manage a meetup group and how to study and for that Chuck (that's me) am forever indebted. Thank you Vince! Well long story short we have grown to a local group of over 420 people as of April 2012 with a much broader reach and vision partnering with other groups across the country and internationally to bring a fuller learning experience to all who are interested in learning Italian. With the help of many we now offer an email exchange program, online educational material, pod casts, instructional YouTube videos, related blogs written from Europe and the US and so much more.